Event | The contestants are on the starting grid ... there's the checkered flag ... and ... nothing. No roaring engines, no wheel spin. In the distance a small engine mumbles and the contestants start to move in slow motion. 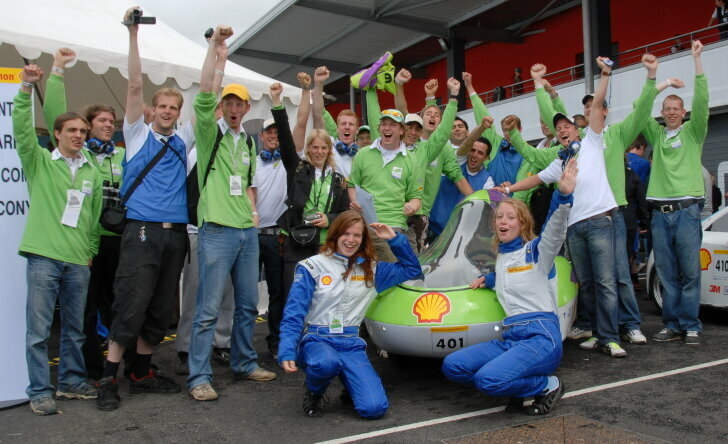 This is not just any race, this is the final of the "Shell Eco-Marathon". From 22 to 24 May teams from all over the world met for this ultimate economy run. Autozine reports. The purpose is simple: which is these brave teams drives the longest distance on one liter of fuel. After that it gets complicated, because teams of universities think of very clever ways to safe fuel. The track is filled with the strangest little vehicles. They are split into two categories: the "Urban Concepts" and "Prototypes". The "Urban Concepts" are like real cars. They have four wheels, a place to sit, a roof, headlights and other standard car features. Thanks to student car designers some of these little cars are very beautiful. Just because of these the public loves to watch the race. The "Prototypes" resemble "cigars on wheels", where the drivers lay down instead of sit down. "Gas guzzling" things like a roof and doors are no longer required. The technical specifications are much more extreme, the fuel economy sensational: 3,000 km out of one liter of fuel is no exception. In both classes a minimum speed of 30 km/h has to be met and the driver has to weigh at least 50 kg. Anorexia-girls are the heroes of these teams. When the race starts it is quiet on the grid. To save fuel the engines are only started at the very last moment. Therefore it is interesting to see which cars will move at all. During this slow motion race the strategies vary. Some drivers maintain a constant, low speed. Others choose to build up speed, shut down the engine and then cruise for as long as possible. The most efficient vehicles can free wheel as much as half a lap and use the engine for just a few seconds per round! These different tactics make the "Eco-Marathon" interesting to the public. The spectators speculate among themselves which strategy will work best. Many cars do not last for a full race. The construction has seldomly been tested on the long run (a race takes one hour). Then it appears that lawn mower engines, airco clutches and pram-wheels are not meant to race. The team members cheer their car on when it makes it through another lap. The tension can be read from the faces when a car stays out of sight for too long or when a vehicle makes unexpected extra noises. 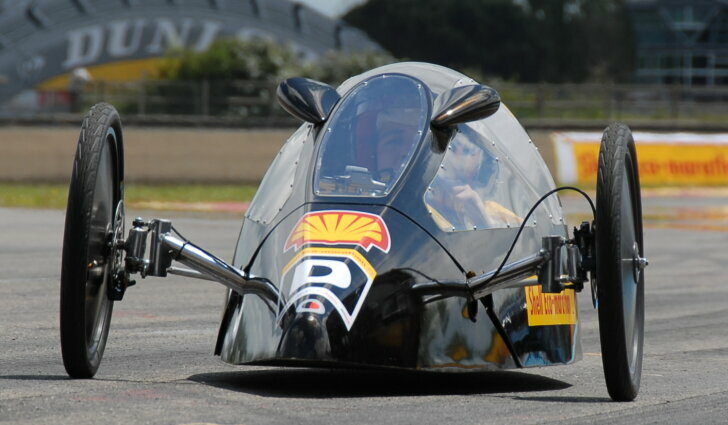 At the end of each race the fuel consumption is measured by the Shell officials. This is the moment all contestants dread. To be able to compare scores, the usage of alternative fuels is converted to that of regular petrol based on the energy properties. Winners of the "Urban Concepts" class are the Dutch "HydroCruisers". With tunnel tests, telemetry on the track, a well oiled pit crew and good sponsors many Formula 1 teams can be jealous at these students! After a nerve wrecking start and a sublime race, their hydrogen fuel car realized a world record of 848 kilometers per liter! 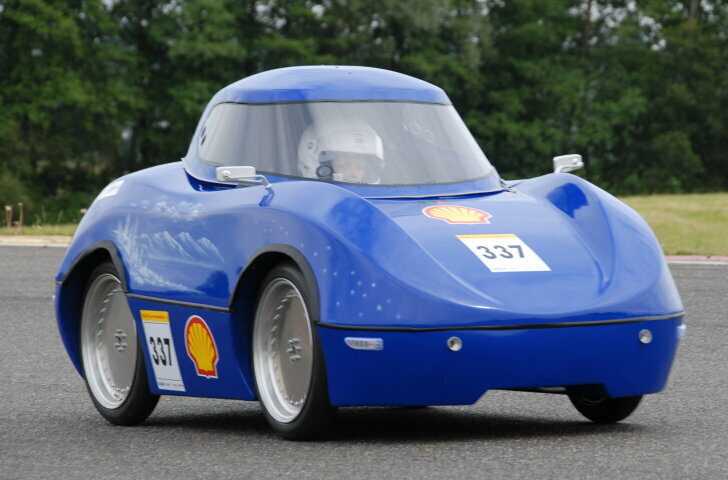 The most economic traditional internal combustion engine is from the Swedish "Baldos"-team, that covered 299 kilometers on one liter of Shell petrol. The team owes its success to good teamwork of the five disciples their university offers. A home made system for exhaust gas recirculation also makes this car extra economic. One of the best looking cars comes from Denmark. The "Roadrunner" resembles a miniature Jaguar, but runs on a newly developed fuel. According to the team "Dimethyl Ether" offers all of the qualities of diesel, but can be made from bio-mass. The result: 265 km on 1 liter. For the French this is a home match and therefore they sent as much as 103 teams. 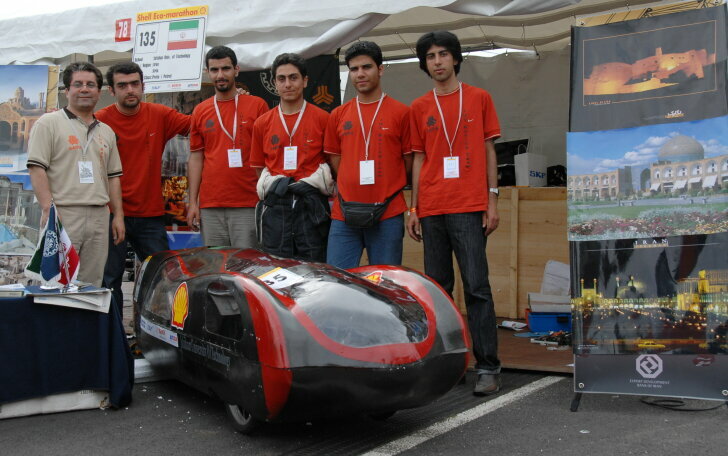 Especially in the "Prototypes" class France rules: the winning team covered a distance of 3.382 on one liter of fuel. The most outstanding French contestant is a bamboo car; a material that grows quickly and is light weight. Because of a heavy engine (125 cc = Hummer-like proportions in this world) on LPG, this eco-model did no better than 74 km per liter. Even Iran sends a team. 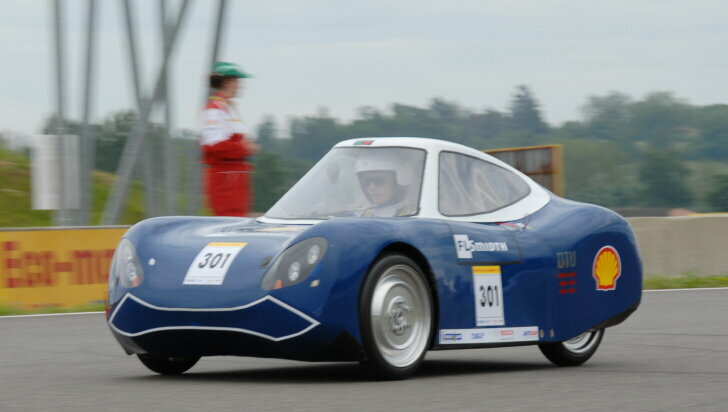 Thanks to a lawn mower engine, a home made CPV-gearbox ("Continues Variable Planetary") and a custom computer they drove 171 km on one liter (90th place overall). Despite this average score the event was a big success for them. Their goal was to exchange culture and to learn. And that's exactly what it is all about during this event. The aggression that is so typical for high speed races has been exchanged for friendship. Economizing has never been this much fun! 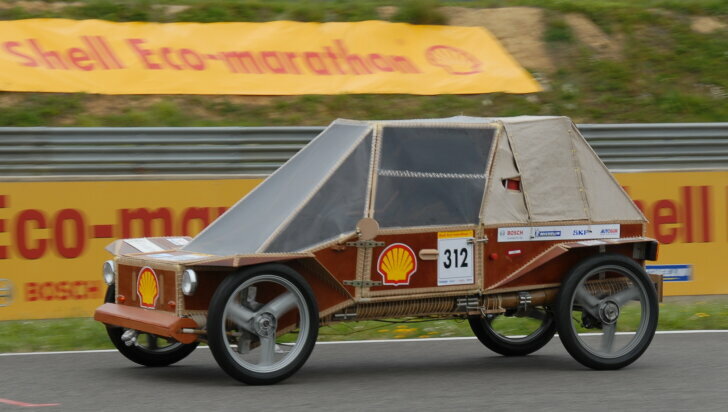 The "Shell Eco-Marathon" does not offer the thrill of a traditional race. This is a different game; a better game! The technical aspect still plays a crucial role. This is what it is all about for Shell: it wants to make students enthusiastic for technology and build on the cleaner energy of the future. But besides the technology the "Eco-Marathon" is about tactics. High speed racing is all about basic instinct: don't think just go. An economy run is all about strategy and intelligence. A large budget is no guarantee to win, a good concept and teamwork is.